Uwe Boll. Dolph Lundgren. 'Nuff said! In an early retailer announcement, 20th Century Fox says 'In the Name of the King 2: Two Worlds' is coming to Blu-ray on December 27. This modern-day warrior has been summoned to defeat the forces of darkness and fulfill an ancient prophecy. But as he fights his way to the truth, Granger learns no one can be trusted -- and one wrong move could cost him not only his life, but the future of his world. 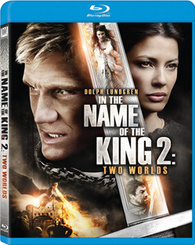 The Blu-ray features 1080p video, a DTS-HD Master Audio 5.1 soundtrack, and supplements will include Behind the Scenes of In the Name of the King 2: Two Worlds, From Page to Screen: Writing In the Name of the King 2: Two Worlds, and commentaries with director Uwe Boll and writer Michael Nachoff. You can find the latest specs for 'In the Name of the King 2: Two Worlds' linked from our Blu-ray Release Schedule, where it's indexed under December 27.